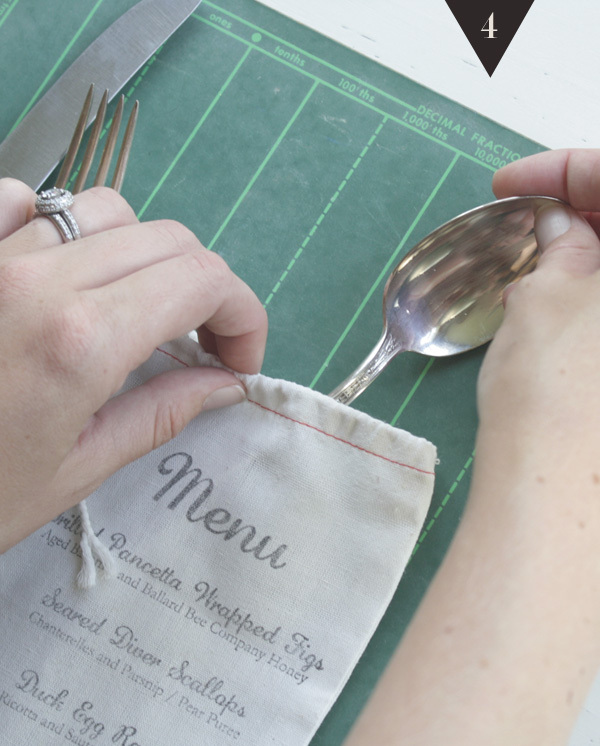 SCOUT blog : Jenn Elliott Blake | DIY Menu Inspiration. 1. 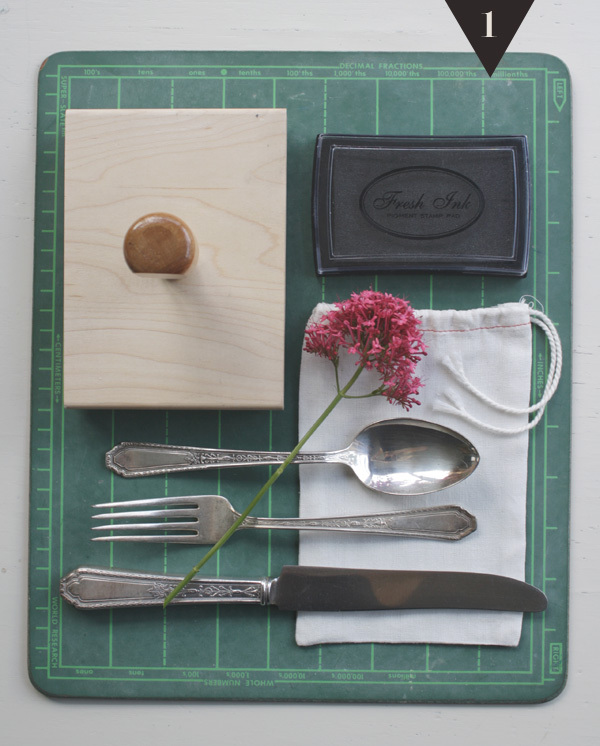 Gather all your supplies – muslin bag, stamp, ink, flatware, pop of color. 2. 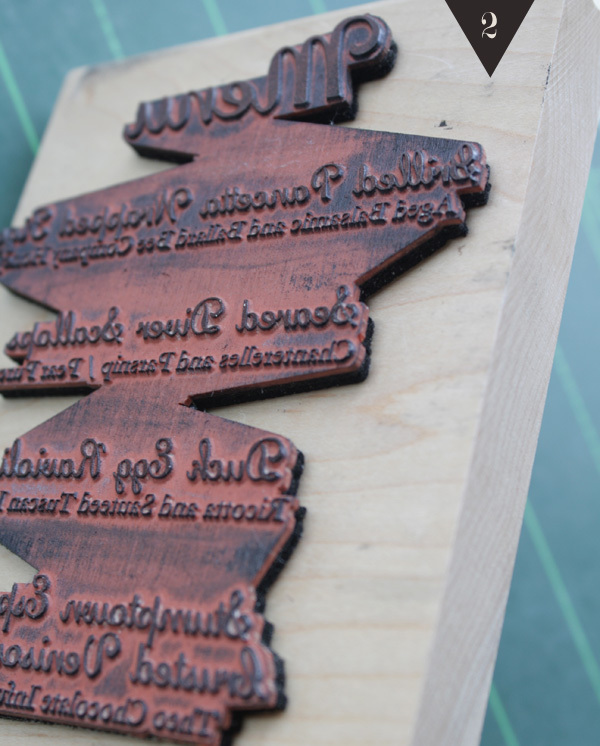 Brainstorm menu courses and create custom stamp. I created my custom 4×6 extra large stamp here. 3. Press stamp in ink and carefully place atop muslin bag making sure to practice first and also placing sheet of cardstock in bag to prevent bleeding. 4. 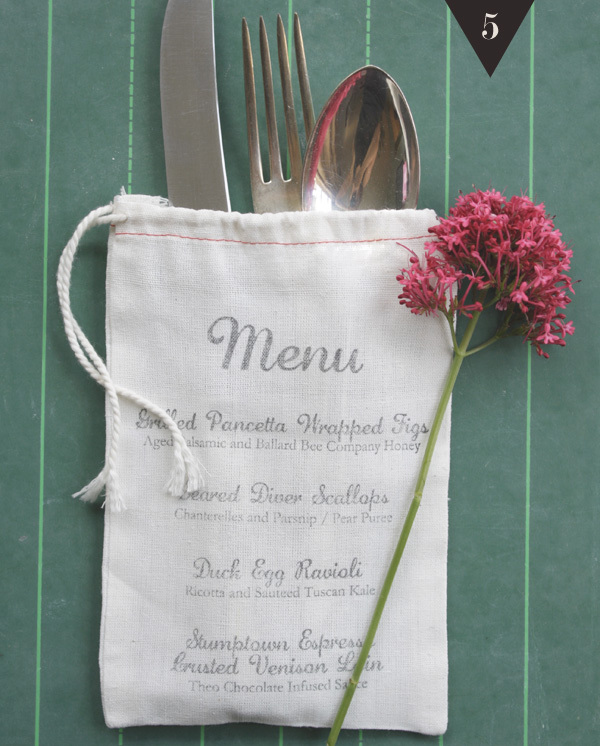 Add desired flatware or favor to inside of bag. 5. Add floral or herb topping and voila! Awhile back I was asked by Seattle Bride Magazine to come up with a unique menu idea for their fall/winter 2012 issue. I wanted to create something that was relatively simple for any bride and groom to create and wasn’t extremely expensive as more times than not my clients are “on a budget.” So I got to thinking and all the while I wanted to create something that would have a unique eye-catching quality AND duel purpose. 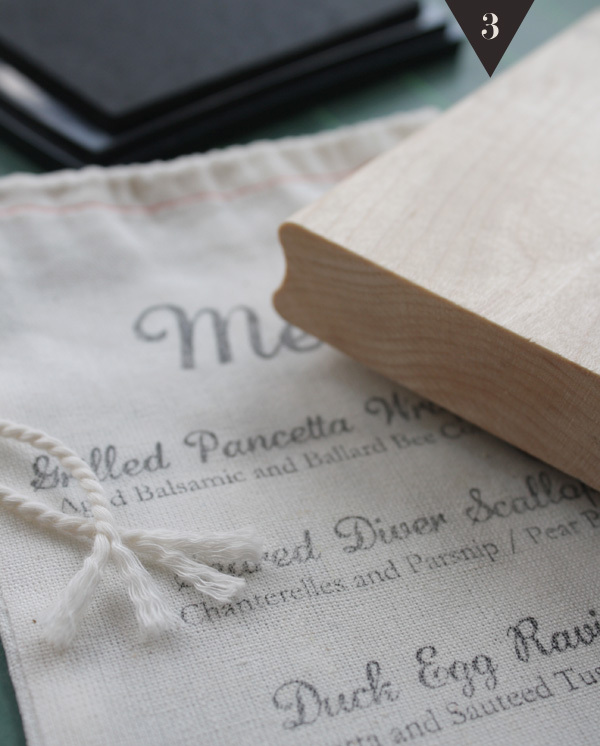 I decided to use muslin bags as the base of the menu and then created an extra large customized stamp to add the wording of the menu. My dear friend Seth Hines was kind enough to create a Seattle inspired menu for me (Seth is a food lovers dream…the guy makes the best looking and tastiest grub and has impeccable style!). With a couple added touches like antique flatware from SCOUT. + a pop of color, you’ve got yourself a menu bag for around $1 a pop! Hope you enjoy this DIY and be sure to check out the current issue of Seattle Bride on newstands now! To see the original shoot for the magazine including other amazing menu ideas click here. Oh! You know I love this! Sooo cute! How clever you are! Amazing idea! What size bags did you use? Where did you buy them? Thanks. hi! could you tell me what font you used? 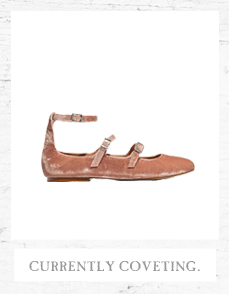 i have tried them all but can’t seem to be getting the look of yours (i am in love!). hello! the font i used for this particular DIY is laurenscript. hope that helps! That is very helpful! Thank you. If I pull this off, I will give you due credit for it. This is very beautiful.